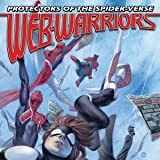 Collects Web Warriors #1-5 and material from Amazing Spider-Man (2015) #1. Your favorite web-slinging wonders from SPIDER-VERSE, together on one titanic team! 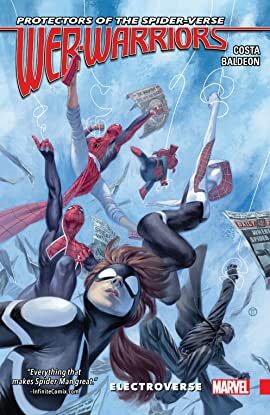 Spider-Gwen, Spider-UK, Arana "Spider-Woman" Corazon, Spider-Man Noir, Spider-Man India and the porktacular Spider-Ham have banded together to protect the worlds without wall-crawlers from their base on Earth-001. But when Electro and his own army of alternate-reality evildoers wreak havoc across the Web of Life, it will take the whole team — plus some amazing Spider-guests — to stop him! Gwen finds herself stranded far from home, but the breakout star of SPIDER-VERSE is no damsel in distress. Can she find her way back to the fight in time, before things go from bad to Electroverse? They're the Web-Warriors, and their not-so-friendly neighborhood is all of reality! All of your favorite web-slinging wonders from Spider-Verse, together in one place! ! From their base on Earth-001, it's up to Spider-Gwen, Spider-Man Noir, Spider-Man India, Spider-Uk, Spider-Ham and a ton of other surprise spider-guest-stars to protect reality!